I mentioned yesterday that the painting project has turned into a bigger project then I had originally anticipated. Now Greg wants to remove all the paint from the woodwork in the room. The paint is probably lead-based. 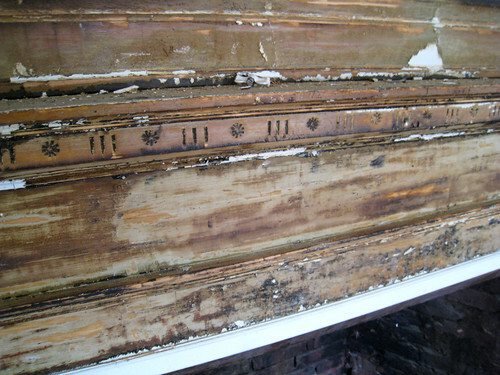 We plan on having children in the house so we would like to take the time to remove as much as the paint as possible. I honestly wasn’t that freaked out about the paint. 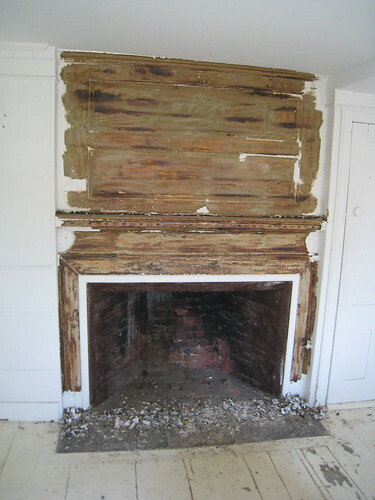 Lead paint’s biggest danger is one it crumbles or cracks. Children could eat the chips which could cause permanent brain damage. 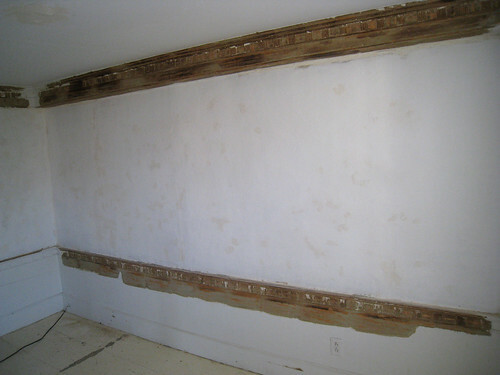 Many people remove lead based paint from old windows. When you constantly open and close the windows small amounts of the paint gets worn away which could then cause the contaminated substance to enter the air. We have new windows so we don’t have to worry about that part, yeah! So to be super safe we are taking the time now to remove the paint all around the house. Below are some photos of the process. 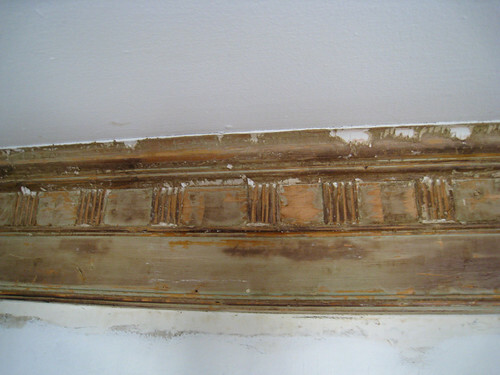 We found a pretty little flower detail hidden on the mantel last night (below). 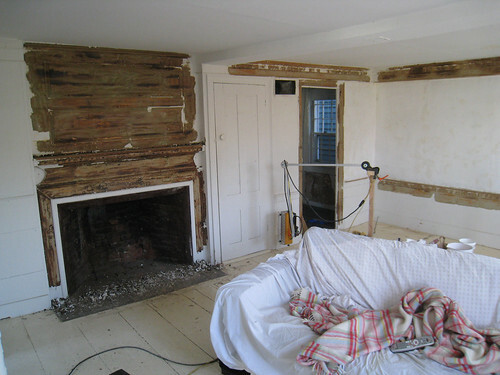 I’ll post a little info on how the stripping process works this afternoon. Doesn't sound creepy. I've actually been getting a lot e-mails from people that have lived in marblehead! i found your blog by doing a google image search for tiny floral wallpaper. now get ready, this is going to sound creepy. your house looked SO familiar, i knew it was from somewhere near my hometown of beverly, ma. it wasn't until i saw the "marblehead postcards" sign in a storefront window that i figured it out. i've probably driven by it many times. your home is beautiful already and i'll be checking your blog to see the progress. it's inspiring me to consider moving home when i'm ready to settle down. How fun!! Can't wait to see the progress.